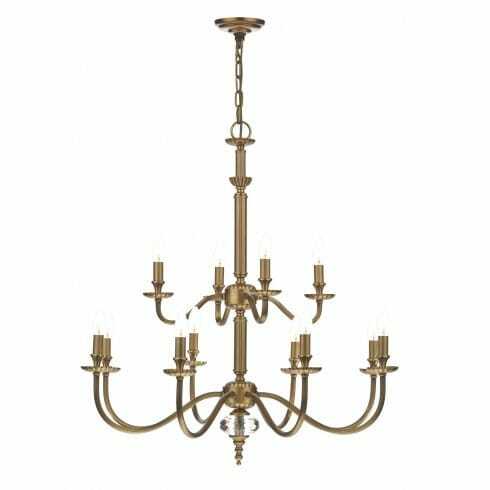 Dar Lighting Atlanta 12 light ceiling fitting displays a classic, Flemish style chandelier with long, sweeping arms arranged in two tiers around a central decorative baluster. A faceted lux crystal finial sits at the bottom of the baluster and completes the timeless look perfectly. The product code for this Dar chandelier is ATL1275. This grand chandelier compliments more traditional spaces perfectly, and its considerable size will be better suited to larger spaces. Height is adjustable at the time of fitting while the chandeliers dual mount capabilities enable semi-flush installation to save on space. This chandelier may be ordered with optional mushroom coloured, faux silk candle shades which can be purchased by adding 12 x item code ATL0733 to your basket. To extend the look throughout your home please see our website for the matching double wall fitting, two light table lamp and the smaller sized 6 light chandelier.